NEW BRIGHTON, MN (November 2, 2016) – Bernice (Carlson) Stohlberg, 96, widow of Covenant pastor Paul Stohlberg, died Tuesday, October 25. Bernice was born December 16, 1919, in Minneapolis, Minnesota, and grew up in Sioux City, Iowa. She graduated from North Park Junior College and worked at First Covenant Church in Chicago. She married Paul Stohlberg in 1948. The couple served Colony Covenant Church in Kingsburg, California; Leyden Covenant Church in Denver, Colorado; and Salem Covenant Church in New Brighton, Minnesota. 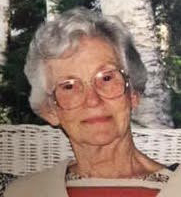 Bernice served on the Covenant Women’s Historical Commission and contributed to volumes of its “Women to Remember” book series. She also did the marketing for Covenant Village of Golden Valley, Colorado, as it was being constructed. Paul died in 1978. Survivors include two daughters, Mary Paulus and Elizabeth Anvary (Ross); and two sons, Mark Stohlberg and Timothy Stohlberg (Marcia); nine grandchildren and seven great-grandchildren. A memorial service will be conducted at 11 a.m., Thursday, November 10, at Salem Covenant Church in New Brighton, Minnesota.